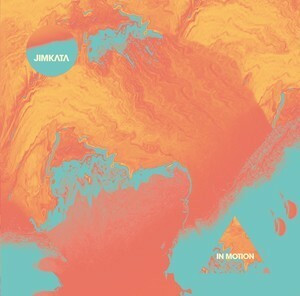 ALBUM REVIEW: JIMKATA, "In Motion"
Very much in that new vein and crop of ’80’s-influenced synth-pop comes the third release from Ithaca, New York’s Jimkata, a trio who know that part of the key to success for that particular sound is the skill and art in writing a memorable pop song. And this album has plenty. From the moment the album begins with the aptly-titled “Wild Ride”, you know you’re in for something good. Not quite wild, per se, but catchy and memorable, which is what counts. “Build Me Up” has a bubbly sweetness about it, which dispels the notion that electronic-based music is cold and mechanical; if anything, there is a very obvious warmth and sense of purpose in the lyrics. “Ride The Wave” has a crisp guitar riff that directs the song, with neatly taut drums and builds an intensity to the “orchestrated” chorus, which has a “spacey” feel; “In The Moment” switches directions and gets funky with a groove and straight dance beat (quite good) and subsequently, “Innocence” also has that get-down vibe (not too distant from a lost New Order track). A fine release; Jimkata are a band that does have some very well-defined touches that make their sound stand out. And as I said previously, they have a strong sense of melody and song structure, which is everything. In Motion? Yes. Absolutely – in more ways than one.